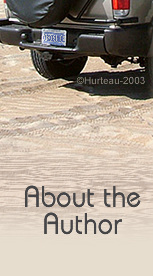 CarolinaOuterBanks.com is the brainchild of Fred Hurteau, who conceived, designed, wrote, photographed and executed every aspect of this site from the ground up. It's original incarnation was created in 1999 from 35mm slides of the Outer Banks he had photographed over 25 years earlier. 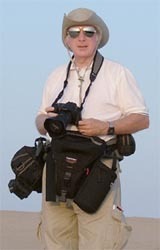 Later he set out to create a more comprehensive, higher quality collection of Outer Banks photos and information. That brought about a second web site, which has since been merged with the original site to create the current CarolinaOuterBanks.com you see here. His long fascination with the Outer Banks continues to fuel his interest in promoting and sharing with others its mystical beauty. The author on Jockey's Ridge photographing a spectacular October sunset. Fred's commercial art and graphics design experience has spanned 40 years in business and education. This includes art direction and design for commercial printing, videography, news writing and feature photography, and computer software/hardware reviews and feature writing for national computer magazines. Fred's career as a computer graphics illustrator, animator and web designer helped to keep his creative energy under control. But that creative energy still managed to spill over into his hobby interests, which are numerable.